The Ukimi-do Pavilion is a hexagonal gazebo with thatched cypress roofing, floating at one edge of Nara Park's Sagi-ike Pond. It's geometric shape reflects beautifully in the water below, and the building itself serves as a rest spot along the waterside. The former Ukimi-do Pavilion deteriorated from age, and its current successor was restored and rebuilt over a period of three years from 1991 to 1994, bringing it back to its former beauty. 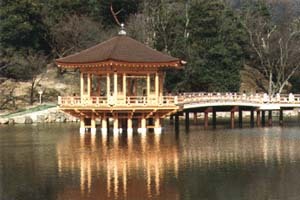 The pavilion is located just past Asajigahara, near Kasuga Taisha Shrine. JR Nara Station, Kintetsu Nara Station: 5 minute wlak from "Daibutsu-den Kasuga Taisha-mae" bus stop on the city loop bus.